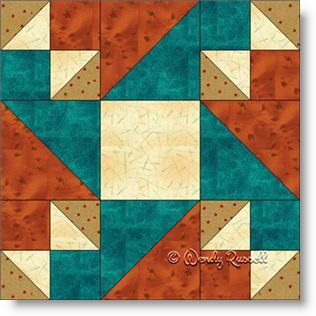 The Indiana Star quilt block is a simple nine patch with utilizing half square triangles of two different sizes. At first glance this block does not look overly interesting. I chose to use two focus fabrics, rather than the usual choice of one dominant fabric and the other being the background fabric. As a result, when blocks are placed side by side in your quilt, a secondary, directional pattern emerges. The second quilt layout, being blocks on point, gives an entirely different look, especially when sashing is used to separate the quilt blocks. So, once again, your heirloom is only as limited as your imagination.